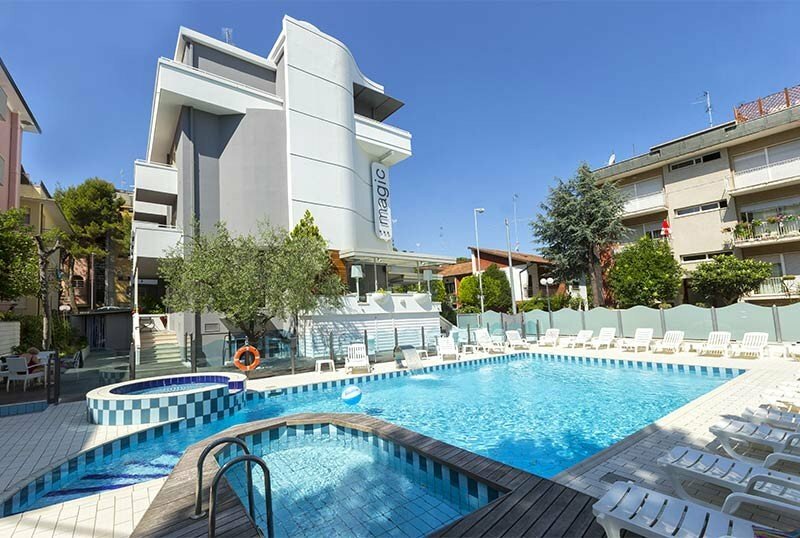 The Hotel Magic, three stars of Riccione, is a modern and welcoming structure with garden, large swimming pool, hydromassage, design rooms, WI-FI with fiber and many services for families with children and cyclists. The hotel, awarded for its commitment to environmental sustainability, offers a cuisine based on organic ingredients and km 0, with a menu of meat and fish of the Romagna and Mediterranean tradition. Admits small pets. The hotel is located in the center of Riccione, a minute's walk from Viale Ceccarini, opposite the Palacongressi. Even the beach can be reached comfortably on foot, as well as the train station. Nearby there are several sports facilities: tennis courts, soccer, squash, skating, gyms and the swimming stadium. All rooms have: balcony, air conditioning, WI-FI, private bathroom with shower sliding, hairdryer, electric shutters and electronic safe, telephone, minibar. LCD TVs, with digital terrestrial, range from 26 to 32 inches. FIORDALISO : the most convenient for an adult with a child or a couple with a cot. Measure 10 square meters. SUNFLOWER : for families with 1/2 children. It measures 13 square meters. NARCISO : renovated design rooms, max 4 beds. It measures 13 square meters. ULISSE : marine-themed rooms, created in collaboration with the Oltremare Park. It measures 13 square meters with a large family shower. NARCISO FAMILY : design rooms for large families, up to 2 adults with 3 children. Measure 20 square meters. NARCISO CHROME : in addition to the comfort of the room, Narciso Family offers a relaxation area on the balcony with a chromotherapy shower. Measure 20 square meters. The property offers its guests a pool of 70 square meters with hydromassage and children's pool, solarium, large garden, free bicycles, professional bike rentals, air-conditioned restaurant, lift, laundry for a fee, theme nights. The hotel is equipped for cyclists. The hotel restaurant is awarded by Legambiente for its attention to local products and tradition. The Virginia Room (overlooking the pool), where breakfast takes place can also be used for small meetings (50 people max), aperitifs, coffee breaks or bridge tournaments. PARKING: reserved in the hotel; reserved and guarded 200 m from the hotel. WI-FI: with fiber, free throughout the structure. CONVENTIONS: beach, amusement parks, discos, free gym, swimming pool. PETS: small pets are allowed. BREAKFAST: buffet with fresh products, homemade organic bread, homemade ring-shaped cake, grandmother tarts and biscuits with whole wheat flour, freshly baked croissants every day, fresh fruit, yogurt, local honey, soy milk, cereals, fresh fruit juices, chocolate, jams, muesli, organic biscuits, cheeses, meats, eggs and coffee. LUNCH AND DINNER: 3 or more choice menu with meat and fish dishes, side dishes, vegetables and hors d'oeuvres, wide selection of wines. Pasta and desserts are home-made, Km0 products are used. OTHER: every week with the "romagnola" dinner you can taste the main typical dishes. In the hotel: swimming pool for children with 50 cm deep water, indoor playground area, strollers, pediatrician, baby sitter meal time, entertainment, baby / mini club, "sweet" corner. On request, swimming lessons and babysitting service by the pool. In the room: cots, cribs, night lights, copripres, high chairs, baths. At meals: baby menu, high chairs, bottle warmer, afternoon snack. The "aquarium" area is the large outdoor area where you can relax between the swimming pool and the solarium. The pool measures 70 square meters and features hydromassages, cervical hydrojets and showers at different temperatures. A smaller pool, 50 cm deep, is perfect for children who can have fun in complete safety. In the evening the pool is surrounded by an elegant atmosphere illuminated by colored lights. There is a WI-FI zone. Cyclists can hire professional bikes (racing, trekking, MTB) with various types of chassis. There is also a secure bicycle storage facility, a small repair shop and a massage therapist on request. Sports enthusiasts can count on an energizing breakfast. The management of the Hotel Magic is attentive to the care of nature as much as to the customer. That's why it was awarded by Legambiente, adhering to the decalogue of good practice in terms of eco-sustainability. The structure has 8 solar panels that cover the daily need for hot water. Lighting is 70% low consumption and 25% LED. Heating and air conditioning operate through methane consumption machines. Cleaning products are environmentally friendly and have a low impact on the environment. Separate waste collection also includes containers for spent batteries and cans. From breakfast to dinner you can enjoy homemade products, zero km and organic wines. The hotel has a special agreement with the Bagni Mauro 78 bathing establishment with children's playground area, games room, nursery, relaxation area, bar-restaurant, hot showers. Prices are per day per person for a minimum stay of 5 days. TOURIST TAX: Excluded. € 1.80 per day per person, for a maximum of 7 consecutive nights, excluding children under 14 years. - Single room: € 10.00. - Your room will be confirmed upon receipt of the deposit, we ask about 30% of the stay for stays over 3 days, for stays shorter than the balance of the first night. Postal Order: Hotel Magic Via Abba N° 3 47838 Riccione RN - in the reason it is important to write "caparra (date of arrival) Mr. (name)"
Bank Transfer: IBAN CODE: IT 87 OR 07090 24103 0110 1000 6815 F.lli Migani S.a.s. - in the reason it is important to write "caparra (date of arrival) Mr. (name)"
- Cancellation: In case of cancellation of the reservation within 3 weeks from the scheduled arrival the deposit will be refunded entirely less 15 euros of bank charges; In case of cancellation within 5 days of arrival the deposit will not be refunded but you can reuse it within the current season; In case of cancellation in the last 5 days from the date of arrival, the deposit will be retained. - In case of early departure, the day of departure is also charged. Book our "Family Offer" from 26 May to 16 June 2019 Child up to 6 years FREE "
Offer "HAPPY FAMILY" FROM 1 TO 8 SEPTEMBER 2019 ALL INCLUDED in RICCIONE! Take advantage of our beach hotel weekend offer in Riccione! Every weekend from March 15th to May 31st 2019 you will have the possibility to book from € 30 per day per person. Breakfast buffet sweet and savory and with BIO products. Plan your weekend with friends in Riccione! - Traditional Easter Lunch with traditional romagnola menu. Book our "Free Bimbo June Offer" Riccione 2019 and you will have convenience and quality! - Stroller Peg Perego as a present upon your arrival! We have Family rooms and Theme rooms.